This article is about the municipality in India. For its namesake district, see Chitradurga district. Chitradurga (also known locally as Durga) is a city and the headquarters of Chitradurga district which is located on the valley of the Vedavati river in the southern part of the Indian state of Karnataka. It is located about 200 km from the state capital Bengaluru. Chitradurga gets its name from Chitrakaldurga (or Picturesque castle), an umbrella-shaped lofty hill found here. Chitradurga was also known by the names Chitradurg, Chitrakaladurga, Chittaldurg. Chittaldrug (or Chitaldrug) was the official name used during the British rule. Also known as Farkhabad during Tippu sultan rule. Chitradurga features bold rock hills and picturesque valleys, huge towering boulders in numerous shapes. It is known as the "stone fortress" (Kallina Kote). According to the epic Mahabharatha, it is not confirmed about this story that a man-eating Rakshasa named Hidimba and his sister Hidimbi lived on the hill. Hidimba was a source of terror to everyone around while Hidimbi was a peace-loving rakshasa. When the Pandavas came with their mother Kunti in the course of their exile, Bhima had a duel with Hidimba in which Hidimba was killed. Thereafter Bhima married Hidimbi and they had a son named Ghatotkacha who had magical powers. Legend has it the boulders were part of the arsenal used during that duel. In fact, the boulders on which major part of the city rests belong to the oldest rock formation in the country. An opening in the rocks of Chitradurga fort that was used by Hyder Ali to send his soldiers. This attempt was defeated by Obavva. Chitradurga is located at 14°14′N 76°24′E﻿ / ﻿14.23°N 76.4°E﻿ / 14.23; 76.4. It has an average elevation of 732 metres (2401 ft). 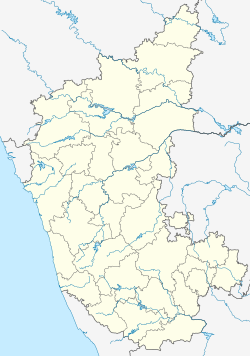 Chitradurga city is well connected to Bengaluru, Mysuru, Mangaluru, Davanagere, Hubballi, Hospet, Bellary, Shivamogga, Tumakuru, Vijayapura, Belagavi, ... ,etc. by Bus through KSRTC. Both NH-48 & NH-13 meets at Chitradurga City. Chitradurga city is well connected to Bengaluru, Mysuru, Delhi, Varanasi, Hospet, Bellary, Tumakuru, ... ,etc through Railways. Mardihalli Pillow lavas national geo-monument at Mardihalli village near Hiriyur has been declared the National Geological Monuments of India by the Geological Survey of India (GSI), for their protection, maintenance, promotion and enhancement of geotourism. As of 2011[update] India census, Chitradurga had a population of 1,25,170. Males constitute 51% of the population and females 49%. Chitradurga has an average literacy rate of 76%, higher than the national average of 59.5%; with male literacy of 80% and female literacy of 72%. 11% of the population is under 6 years of age. Wikimedia Commons has media related to Chitradurga. ^ "Chitradurga MP". NIC. Retrieved 13 October 2014. ^ a b Chisholm, Hugh, ed. (1911). "Chitaldrug" . Encyclopædia Britannica. 6 (11th ed.). Cambridge University Press. p. 247. ^ "About Chitradurga". Chitradurga City Municipal Council. Retrieved 19 February 2014. ^ "Tourism in Chitradurga". Chitradurga city municipal council. Retrieved 19 February 2014. ^ "Bharat: An Untold Story - Chitradurga". Tumbler.com. Retrieved 19 February 2014. ^ "Chitradurga Fort". Chitradurga District. Retrieved 19 February 2014. ^ "Synthetic track at Obavva stadium ready". Times of India. ^ "Geo-Heritage Sites". pib.nic.in. Press Information Bureau. 9 March 2016. Retrieved 15 September 2018. ^ "Climate data for: Chitradurga". en.climate-data.org. Retrieved 16 August 2016. ^ "Census of India 2011: Population details". Census Commission of India. Retrieved 12 August 2015. ^ "Home of Chitradurga City Municipal Council". Chitradurga City Municipal Council. Retrieved 19 February 2014. ^ a b "Bastion on the hill - Chitradurga Fort". The Hindu. 7 March 2013. This page was last edited on 10 April 2019, at 18:48 (UTC).